I confess: I am a snob. Not an everything snob, just a few things snob. I love clean grocery stores. I will pay extra just to go there. I tried, I really did try to do my regular, everyday, basic-staples-in-the-pantry in a cut price, bargain store but it didn't work. After a few weeks, my eyes fastened on the dirty floors instead of the price tags and I just couldn't do it any more. Bring on the clean! bring on the bright! My other snobbery is the Folio Society, a publishing house based in London (UK) specializing in beautiful books, the kind that could be passed down as heirlooms. It actually is relative to aging because it is relative to my aging. It's only in the last few years that I am comfortable spending that kind of money on a book and only then because I don't spend on other things. I don't 'do' clothes. I petted a $2000 dress several years ago but owning one is not on my bucket list. I don't 'do' jewelry, either. A few pretty things, mainly gifts from my family and my collection is complete. So, that brings me back to the book. The Folio Society ships from England; that Royal Mail insignia is my first little thrill! Then, there's the wrapping. Those books are so safely cocooned for their trip across the Atlantic, I swear you could ship fine china in their boxes. Not only are the books not just overwrapped in paper, they are boxed and bubble wrapped and paper wrapped and that's before the shrink wrap which protects the slipcase. Sometimes, the book is not revealed for days. Why not enjoy that Christmas present feeling for a while? When it is finally opened....what joy! what fun! Ah, the aroma of fine paper and quality ink! Or is it the aroma of quality paper and fine ink? All I know is that somehow a beautiful book embellishes even a really good story. 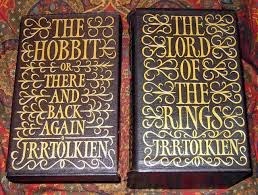 The Hobbit was never so exciting in paperback. It's possible that my snobby hobbies may come to an end soon but at this moment in time, I'm enjoying every trip to the clean, well-lit, superbly stocked grocery store and reading my members-only literary catalogue with my hand firmly on my credit card.